I am really excited to be a guest at The Frilly and Funkie’s Challenge blog where the theme is ‘Summer Heat’. WARNING – LONG POST with lots of photos but you do get a tutorial as well. I really went to town with the hot colours in the Dylusions inks range to create my background and I used a linen textured canvas board so I can display this through the warmer summer months. I started with a layer of gold embossing paste by Wendy Vecchi. I love this not only for the texture it adds but the gold seemed to shine through the layers of ink and gives a gorgeous warm glow to the finished piece. I added some white gesso over the top of the embossing paste, but I think if I did this again I would leave this layer out. Then I got started with the sprays, putting most of the colours on wet for the first layer and letting them run together a bit – you can just see that I spray into a pizza box which helps protect the small area I have to work in. At this point I really wasn’t sure which way up my board was going to be – blue for the sky or green for the grass? But I added more layers of inks by spraying and heat drying in various areas and spraying short bursts of colour over another colour to get mottled effects. To finish I stamped some texture stamps in both distress paint and fresco finish paint. The shabby bloom was inspired by Paula Cheney and you can see her version HERE. I used Dylusions sprays rather than distress stains and you can see how I made my version below. I sprayed really hot colours onto a piece of card and pressed another piece into it, giving me two pieces to use for die-cutting. I used both the tattered florals bigz die as well as the jumbo tattered florals die and chose the size petals I wanted. Using four of each of these three sizes I inked the edges with walnut stain distress ink. I then made a hole in each petal and put the two largest sizes together with a brad and curled each individual petal over with using my awl. Taking the water mister I began spraying each layer and curling the petals upwards and scrunching them as I went along. I then gave it one more spray of water to make sure it was wet through and really squeezed it in my hand until it eventually looked like the photo above. Using a heat gun I carefully dried and unfurled the outer petals to get the sort of flower shape I wanted. Next I took the smallest petals and did the same to them and then glued this little bunch into the centre of the larger flower. Finally I inked some of the edges again with walnut stain again to give the flower a more aged and vintage look. It now measures 12 cms across. The leaves were made in a very similar way using the Dylusions inks…..
…. and the Garden Greens bigz die. When I soaked them with water the ink mixed with it and coloured the reverse side of the leaves. I scrunched them, dried them and inked them as before and added to the board with the flower. It would be lovely to see you over at Frilly and Funkie if you have time, but thanks for stopping by and thanks for getting to the end of a long post. Apologies to Fliss and Shilpa who left me a message when I inadvertently published this post last week. A slip of the finger, but it has it's consequences duh!!!!!!! Thank you to Linda and the team for asking me to guest today, I have so enjoyed making this journal board and it’s certainly a project I will do again. Enjoy the rest of the week and have some fun creative time. Wow Brenda! An absolute stunner and the colour looks just amazing. Stunning mixed media piece, Brenda. Love how you have created the texture for background!! Love all the texture and colors! The flowers is spectacular! Congratulations on your GD spot Brenda. This is a beautiful project, awesome colours on the textured background. The flower and leaves are stunning.....a beautiful Summer Themed piece. Oh my Gorgeousness! Brenda, what a lovely canvas. Love the texture you built up and those great warm colors. That flower is amazing! Hugs! Beautiful job Brenda - love the bright colors of Dylusions. The flower is stunning. Fabulous project! Lovin' that flower! Summer Heat is putting it mildly- the colors are perfect and the flowers just beautiful. It is well worth the long read. Great job!!! Love, love, love your gorgeous project, Brenda! The colors are just amazing - such eye candy! What a wonderful canvas to display throughout the summer months. Your tutorial is just wonderful too. Thank you so much for guest designing and helping us fill in our DT vacancy for this challenge. We were just delighted to have your make in our lineup for this challenge. 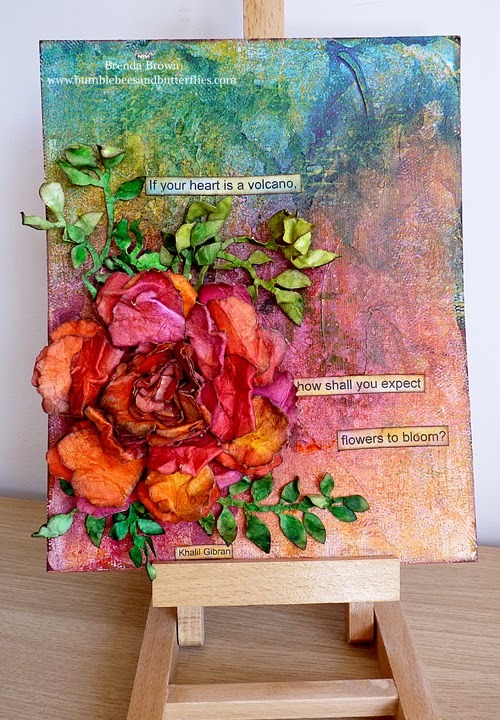 Such a stunning piece Brenda, the colours are so stunning and the flower just looks amazimg!! Gorgeous! I like the background and that it is just the flowers and leaves. Very effective. What a glorious mixed media canvas... I really love the gesso layer, because I like what it does to the Dylusions colours... The flower is absolutely fabulous - and a great tutorial taking us through too, thank you. PINNED! LOVE these gorgeous canvas! So colourful and wonderful creation Brenda! Beautiful flower. I like a lot the background too. Fabulous colors.